The troubled Health Star Rating system for food labelling has been signed off by food and health ministers from the Australian Federal, State and Territory governments. Australian food and beverage manufacturers were ready for the announcement last Friday, with several food companies quick to announce that they would begin using the Health Star Rating system. For more information about how the Health Star Ratings system could be used advantageously, food and beverage manufacturers are invited to attend the upcoming FoodLegal Symposium where food law expert and consultant Charles Fisher will speak on this topic. The FoodLegal Symposium is co-sponsored byFoodLegal, Monash University and Australian Food News. The Health Star Rating System was signed off as part of a meeting of the Legislative and Governance Forum of Food Regulation which took place in Sydney late last week. The Forum consists of all Australian and New Zealand Ministers responsible for food regulation and is chaired by the Australian Government Assistant Minister for Health, Senator the Honorable Fiona Nash. The Forum agreed that the Health Star Rating system should be implemented voluntarily over the next five years with a review of the progress of implementation after two years with a commencement date of 27 June 2014. The Forum said the implementation time-frame had been extended to enable cost effective implementation and the potential for food reformulation and consultation with small and medium sized enterprises. The Ministers considered two new reports on the impact of the Health Star Ratings system on food and beverage businesses. The Forum was presented with a cost benefit analysis prepared by PricewaterhouseCoopers, which explored the cost borne by industry, governments and non-government organisations and the potential benefits to public health with the voluntary introduction of the Health Star Ratings system; and the findings of an independent qualitative study by the Centre for International Economics on the impact of the Health Star Ratings system for small business. The PricewaterhouseCoopers report and the study by the Centre for International Economics will be available on the Food Regulation website. To support the implementation of the voluntary Health Star Ratings system system, the Forum said an education campaign was close to being finalised. The Health Star Ratings system website will be launched when the education campaign has been finalised. The website and campaign will inform both consumers and industry to encourage their participation in the initiative. To ensure industry can adopt the system without delay, the Forum agreed that the Health Star Ratings system style guide and calculator will be made available on the Australian Health Ministers’ Advisory Council website. The Forum also endorsed a process for the Health Star Ratings system Advisory Committee to consider potential anomalies identified in relation to the Health Star Ratings system Calculator, where a star rating may be inconsistent with the Australian Dietary Guidelines or when its use to make comparisons within a food category or across comparable food categories the star rating may mislead consumers. The Forum welcomed the announcement from New Zealand to join the voluntary Health Star Ratings system. The Australian Food and Grocery Council (AFGC) has welcomed the outcome the Forum’s meeting, saying the “constructive approach” taken by the Assistant Minister for Health Senator Fiona Nash and the Department in working with the food industry on the development of the proposed Health Star Rating scheme had resulted in “significant improvements” to the scheme. AFGC Chief Executive Mr Gary Dawson said the AFGC had been a strong supporter of clear front-of-pack nutritional information to better inform consumer choice, with its development of the Daily Intake Guide, which now appears on more than 7000 products. “The improved design of the Health Star Rating scheme, flexibility around its introduction and acknowledgement that it can coexist with existing front of pack schemes such as the Daily Intake Guide and the Heart Foundation Tick, are significant improvements,” Mr Dawson said. “In addition there is acceptance that it can be expensive for cash strapped companies to adopt major labelling changes and therefore a voluntary approach with an extended five year implementation period has been adopted,” Mr Dawson said. “Ultimately it will be up to food companies to assess the scheme and determine whether or not they adopt it,” he said. Mr Dawson said the AFGC supported the right of food and beverage companies to make their own assessment about whether to adopt the Health Star Ratings system, given “ongoing concerns about aspects of the calculator used to determine a food’s star rating, and anomalies with respect to some food categories”. He said the AFGC would also continue to support the Daily Intake Guide. Several Australian food and beverage companies have already announced that they will adopt the Health Star Ratings system. Family-owned Australian food manufacturer Monster Health Food Co (Monster), which was the first food company to implement the Health Star Ratings system, has announced that it will expand the labelling system to include a third product. 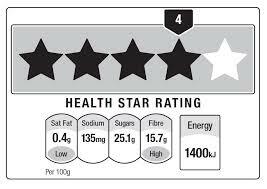 Australian Food News reported in April 2014 that the Company had announced it would introduce the Health Star Ratings system to some of its packaging. Monster said the consumer response to the packaging had been “overwhelmingly positive”. “The response from consumers and retailers alike has been overwhelmingly and universally positive,” said Trevor Lauman, Co-owner of Monster Health Food Co. “This was both philosophically and commercially the right move for us,” he said. Supermarket group Woolworths has also announced it will implement the Health Star Ratings system on its own brand ranges, including Homebrand, Select, Macro and Gold. General Manager of Supermarket Operations, Pat McEntee, said Woolworths is committed to working with the federal government to implement the scheme. “This is another step in Woolworths desire to inspire a healthier Australia,” Mr McEntee said. “Our partnership with global healthy food campaigner Jamie Oliver, our commitment to providing quality affordable fresh food and groceries and now this rating scheme all help our customers make better decisions about the food they buy for their families,” he said. Woolworths said the changes to packaging would be rolled out across thousands of Woolworths products. Labels will be redesigned and packaging changed, with Woolworths saying it would work to ensure this was done quickly without causing disruption to its customers and its growers and suppliers. Food manufacturer Sanitarium Health & Wellbeing has also welcomed the introduction of the Health Star Rating system, saying it would adopt the new Health Star Rating system across Sanitarium’s entire product range, including market-leading products Weet-Bix and Up&Go. “The Health Star Rating system will benefit consumers by assisting them in making healthier choices for themselves and their families, and that’s reason enough for us to get involved,” said Todd Saunders, General Manager, Sanitarium Australia. “This is a major preventative health initiative which offers an opportunity for the food and beverage industry to significantly contribute to improving the health of our nation,” he said. “We know Australians trust Sanitarium products and by providing transparent and easy to understand information through the Health Star Rating system, we are continuing to deliver on the trust consumers place in us and our brands,” Mr Saunders said. Sanitarium said Health Star Ratings would begin appearing on its products over the next few months. Meanwhile, consumer group CHOICE has called on all food manufacturers to start rolling out the Health Star Ratings on products. “CHOICE is today calling on food companies to ditch the dodgy Daily Intake Guide and embrace the Health Star Rating to help consumers make informed decisions about what they eat,” said Alan Kirkland, CHOICE CEO. “Now that ministers have given the final sign off to the Health Star Rating Scheme, responsibility shifts to food manufacturers to start rolling out the star ratings on their product ranges,” Mr Kirkland said. “There is a great PR opportunity waiting for the early adopters, as we’ve seen with Monster Health Food Co which rolled out the first star rating in April,” he said. Food and beverage companies hoping to implement the Health Star Rating system are encouraged to attend the upcoming FoodLegal Symposium, co-sponsored by Monash University and Australian Food News. At the Symposium, food law expert and consultant Charles Fisher will be talking about the opportunities for food and beverage companies in the new Health Star Rating system. Find out more here. Australia’s ageing population presents big opportunities for food and beverage manufacturers.